Can I change my ticket delivery method? For details of the delivery methods available on Loco2, please see our Help article Ticket delivery options. If possible, we will offer a choice of ticket delivery options on the Ticket Details page. If only one of the ticket delivery methods is made available by the rail operator, you will not be given a choice, but the delivery method will be clearly displayed during the booking process. 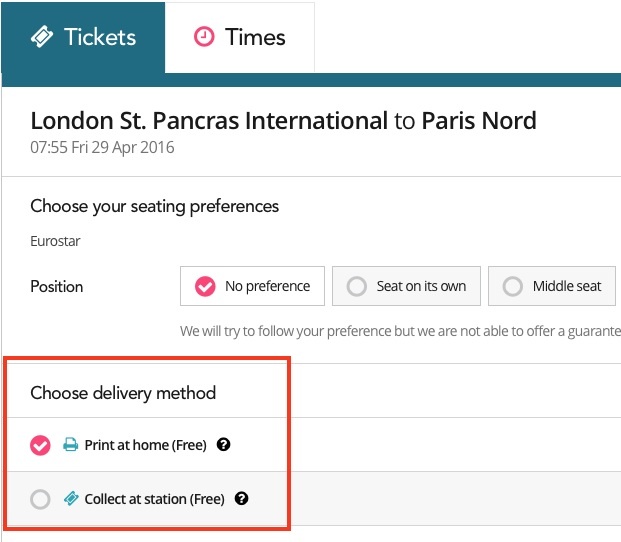 You can use your "PNR" reference number to download tickets from Eurostar. They are available as print-at-home or mobile tickets. You can use your "PNR" reference number to collect tickets at the station (Eurostar terminals only). If you selected mobile tickets but need a print-at-home ticket instead, please contact us. You can collect French Connection fares at Eurostar terminals only (London St. Pancras, Paris Nord). It is not possible to collect French connection fares from SNCF stations in France. Deutsche Bahn If you selected mobile tickets, you can use your "Auftragsnummer" to download print-at-home tickets from Deutsche Bahn. Trenitalia Regionale Print-at-home tickets on Regionale trains in Italy can be present on a smartphone or another suitable mobile device. Trenitalia Paperless tickets for Trenitalia tickets are not available in any other format. Italo Paperless tickets for Italo trains do not require you to have a printout. However, we can obtain one if you need it for some reason. UK trains It is not possible to change the delivery method for UK trains. They must be collected from the station. Renfe-SNCF and other international tickets It is not possible to change the delivery method for Renfe-SNCF trains or other international tickets to/from Spain. They must be printed out before travel. You can present print-at-home tickets for domestic Renfe tickets on your smartphone. You can use your "PNR" reference number to collect Renfe tickets at the station. If the fare conditions of the ticket allow, and your desired ticket delivery method is available, you may apply for a refund and re-book new tickets with your desired delivery method.